In Reunion by John Cheever we have the theme of disappointment, connection, identity, separation, regret and alcoholism. Taken from his Collected Stories collection the story is narrated in the first person by a young man called Charlie and after reading the story the reader realises that Cheever may be exploring the theme of disappointment. Throughout the story Charlie at no stage gets the opportunity to talk to his father. Rather as they are going to each bar and restaurant his father is disrespectful to each of the employees he encounters. Though it is difficult to say for certain if Charlie’s father is already drunk when he meets him there are two signs which point to the fact that he might be drunk. The first sign is at the train station when Charlie tells the reader that he could smell whiskey off his father. Also in the final bar Charlie’s father mispronounces Beefeater Gibsons calling it Bibson Geefeaters. It is because of this and Charlie’s father’s continuous urge to drink throughout the story that the reader suspects that Charlie’s father may be drunk. Which may explain why he is rude to each waiter he encounters. Cheever also appears to be exploring the theme of identity. Despite Charlie telling the reader that his father was ‘a stranger to me’ and that when he sees his father ‘he felt that he was my father, my flesh and blood, my future and my doom.’ There is a sense that Charlie never really gets to know his father or to understand him. All he sees is his father being rude and obnoxious to each waiter he encounters. It would appear that getting served alcohol is more important to Charlie’s father than actually meeting Charlie. At no stage in the story does Charlie communicate with his father. Rather all he is doing is relaying each occurrence or event as it happens to the reader. He never gets to know his father nor does the reader get to know too much about Charlie. If anything Charlie is no more than a spectator when it comes to his encounter and meeting with his father. The theme of separation is also self-evident in the story. 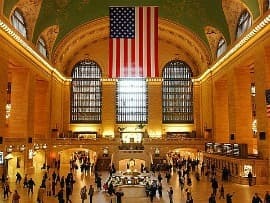 Charlie at the beginning of the story tells the reader ‘the last time I saw my father was in Grand Central Station.’ Prior to this meeting we are also aware that Charlie hadn’t seen his father in three years, since his parents divorced. The reader also senses that there is an element of excitement for Charlie when it comes to meeting his father. However by the end of the story it would appear that Charlie regrets having met his father. His father also rather than making any inquiries about how Charlie is doing in life attempts to impress him instead. This is noticeable by the father’s wish to go to his club, though it is too far away. Also in each restaurant and bar the father rather than using English speaks Italian and French when there is no need to do so. Again the reader suspecting he is doing so in order to impress Charlie. At all stages the focus remains on Charlie’s father with Charlie again being no more than an observer to his father’s actions. There is also some symbolism in the story which may be important. Throughout the story Charlie’s father is drinking gin and by introducing alcohol into the story Cheever may be suggesting that rather than connecting people, who might sit down and have a drink together. In the case of Charlie’s father alcohol disconnects him from his son. His main focus in the story is getting alcohol rather than hearing about how Charlie is. At no stage do either Charlie or his father make a connection. It is also possible that Cheever is suggesting that a dependency on alcohol (which Charlie’s father appears to have) can result in an individual becoming selfish. Rather than focusing on another person, in this case Charlie, Charlie’s father is focused on getting more and more alcohol. The ending of the story is also interesting as Cheever introduces the theme of separation for a second time. As Charlie’s father is trying to ‘get a rise’ out of the newspaper seller Charlie tells his father that he has to go. What is significant about Charlie leaving is that even though he has to catch his train there is also the possibility that he has witnessed more than he wants to when it comes to his father’s actions. It is possible and it would appear to be the case that the connection Charlie sought with his father is not forthcoming. His father through his own selfishness (or alcoholism) is unable to connect with his son, preferring instead to be rude to people possibly in order to boost his own self esteem or to show Charlie how powerful he is as an individual. That he does not need to be respectful to others. Though again Charlie’s father does show some of the traits that come with alcoholism. Being rude to people, focusing on self and ignoring others. Three things that Charlie’s father has done throughout the story. McManus, Dermot. "Reunion by John Cheever." The Sitting Bee. The Sitting Bee, 23 Apr. 2016. Web.